The study of chemistry with a focus on the atom, element and molecule was in its infancy in 1800. The most important use of this knowledge from the natural sciences was in the production and manufacturing of specific products as medicine, such as the isolation of the first alkaloid from opium latex, the crystallization and concentration of mineral salts for use as medicines or the purification of tannins into tannic acid. Chemicals were also used in manufacturing and construction, like the lime needed for smelting and making iron products, or the metals needed the production of dyes. Even the manufacture of food stuffs was beginning to make heavy use of chemistry knowledge in order for grains to be processed into starch-rich materials and oils to be extracted from seeds and nuts. During the late 1700s, in particular the 1790s, chemistry became a science which could be used to engage in various sorts of investigative activities. The cause for a recent death, the value of a newly discovered mineral water, the contents of a secret patent medicine remedy, each of these could be precisely defined given the right chemical procedures engaged in by an investigative doctor, pharmacist or early example of a forensic chemist. Chemistry also became the primary tool used by physicians to study the reasons for the effects of the opium latex and the recently popularized digitalis root noted clinically and experientially as an effective treatment for “dropsy”, the edema produced by heart failure. Chemistry also put many of the questions we had about the earth’s structure and history to rest, by showing us that that certain rocks bore fossils due to their marine history, and that other rocks previously considered to be products of civilization were in fact very ancient formations produced by Nature, not people. Perhaps one of the most important questions for these chemical studies of natural chemistry was the question related to the mythical island of Atlantis. some local religious leaders were claiming this antedeluvian island once existed just a few miles off the shores of this continent’s east coast. The chemistry of the columns formed by these legendary people were shown to be simple iron rich rock formations–balsatic columns–not the calcium-rich, iron-poor cement pillars made using the well known binding powder fuller’s earth (Med Rep article at end of this blog’s TOC.). In spite of these successes happening in the study of chemistry, there were still a number of highly popular theories out there that seemed immune to the development of new science. The toxin and virus concept often associated with studies of the chemistry of health was never fully related to the study of chemistry during the first decades of the 1800s. The claim that diseases were due to miasma was a philosophy in which its most basic element–the miasma–remained the mythical and legendary description it was in the original Greek and Roman writings. The old phlogiston theory believed during the 1700s remained immune to the concept of chemistry, and was instead simply reconstructed or redefined, with chemistry serving as the reason it had to be true, rather than false. Likewise, along with the newly discovered chemical elements of nature that existed in the body were those of nature. For Samuel Mitchell of New York there was septon, a chemical or element similar to phlogiston in theory that he claimed was responsible for the putrescence of waste and garbage that produced the local “miasma” causing many of the diseases in the rapidly growing New York city setting. Equally important to this period in local medical history were New York Physician and Congressman Samuel Mitchell’s theories on how several of new natural sciences that evolved from the natural philosophy field related to medicine. The science of mineralogy for example was born and a society and special interest group formed of physicians due to the assocaitions being drawn between rocks and minerals, landsurface topography, weather, and the behavior of diseases. Likewise the studies of fossils and mineralogy helped to merge this discipline with its obvious counterparts in natural philosophy–the fields of botany and zoology. Such a set of specialties were accompanied by two other studied of nature serving to differentiate the living from the non-living in nature–meteorology and climatology were the two most important studies that had to be performed in order to improve our understanding of life, health and disease. This rationalization was necessary due to the conflicts arising about the absence or present of a life force or vital energy or “spark”. 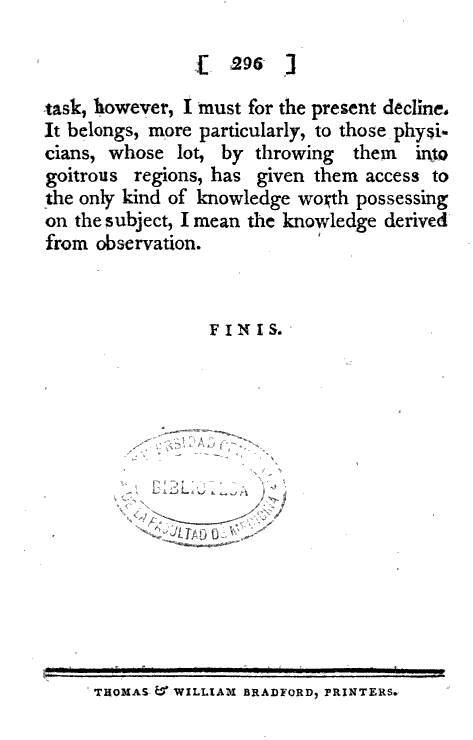 The new studies of astronomy that made use of Newtonianism to define the stars, planets and natural events like meteors, comets and auroras were also used by some natural philosophers to give reasons for everything from the behaviors of the earth itself to the subconscious state of our mind and the very physically active human body and its nervous force. Medicine, like the most basic fields of science from twenty years earlier, was now quite different. One of the first specialties to come out of medicine was ophthalmology, although not really known as such. The oculists were doctors who had perfected their knowledge of the mechanisms by which the eye worked and how to use this knowledge to develop the first visual aids similar to today’s eye glasses. Likewise the dentists had evolved into their own specialty, and even though they performed many surgical practices, they were no longer directly related to the study of chirurgery of the past. The dentists had in addition to their special knowledge a certain amount of knowledge of the nervous system and the processes of pain and anesthesisa, and were the first major profession to implement specific scientific skills into their practicum in order to allay the pain that kept most people away from their offices and instruments. The electric shock devices could be used to numb the face, stop the nerves from performing their functions as pain receptors. This form of medical electricity was developed as an aside to their practice, but became immediately recognizeable as a form of practice with applications to other common diseases with pain such as rheumatism, and those diseases with paralysis such as the early forms of post-apoplexy (stroke) paralysis or the paralysis related to polio. With these other physical sciences well underway as new branches of science, chemistry had evolved into a profession that was a necessary part of learning the natural sciences. Chemistry was a subject that appeared in both “Normal” and higher learning college settings, and was certainly a necessity for official medical school lectureship settings. The early 1800s sessions in medicine often consisted of the special classes devoted to chemistry, with Dr. Mitchell providing the knowledge base for this during the first years of the nineteenth century. 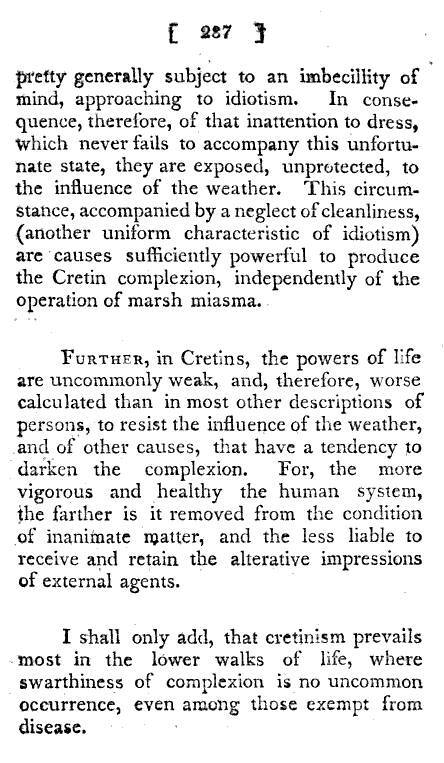 Before chemistry, there was simply “miasm” as a case for illness. In theory this miasm could be inherent or internal to the afflicted body, or something generated by nature. 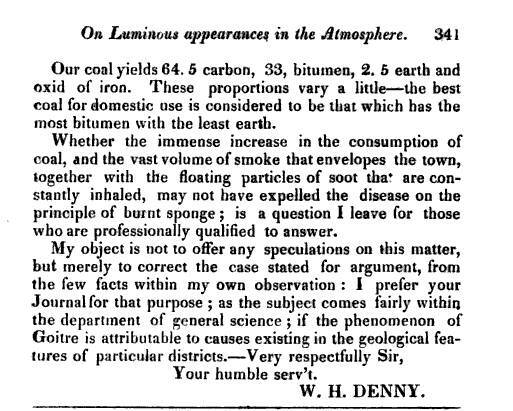 Local topography produced miasm by creating it is two forms according to late 1790s and very early medical writers who were also climatologists. The popular theory of the first decade of the 1800s was that there is an idio-miasm and a koino-miasm. The first we produced when we became ill, which when allowed to leave our body was able to cause disease in someone else. The koino-miasm was that physical substance that we could see being transmitted across the earth’s surface, infecting people, like the marsh gases, mists and fogs, or the humidity and terrible vapours that arose from a surface after a heavy summer rain or the continuous beating taken from solar rays in the mid-afternoon. Another form of miasm common in the books for this time was an invisible substance that existed in thought and theory but no way else. This was the putrid aroma we note that are common in diseased-ridden regions, and the theoretical energy in the air related to lightning, static electricity and even palpitations of the heart and contractions or spasms of our muscles. So with all of this uncertainty about the true definition of miasm, its causes and forms, there were obviously many questions out there about diseases not easily related to miasm the local environment. 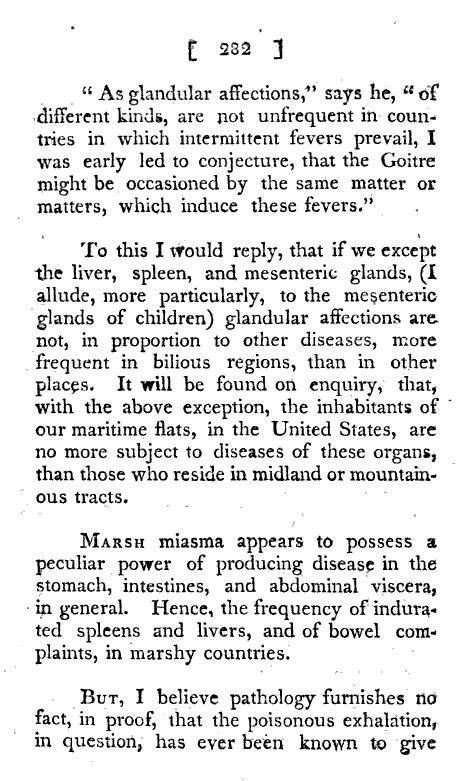 So how would miasma help to describe how goiter develops in the body? With goiter, there were many questions left to be answered regarding the environment, climate, weather and its causes when it came to this common theory. 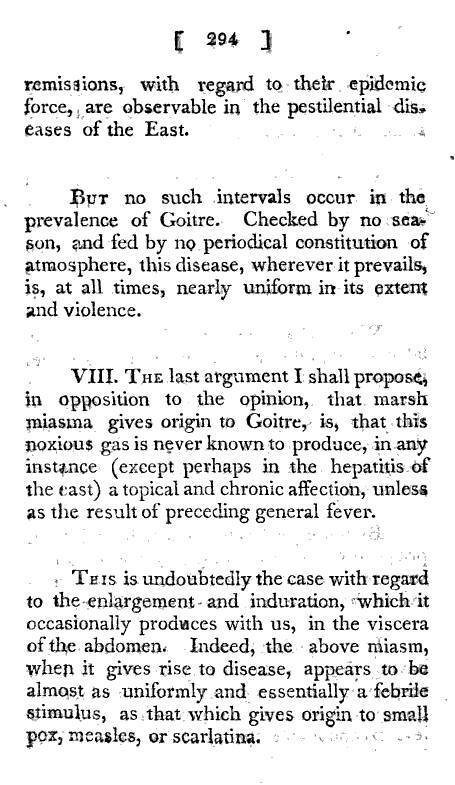 Was Goiter a consequence of the miasma? and if so then was it due to the local environment? Can the miasma of one topographic setting where goiter abounds be different from that of a distinctly different topographic setting? The miasma has been known to develop from the local features, as well as from particular human conditions at times. Does this mean the goiter is just part of a much larger health concern to people surviving in these places where goiter appears to become rampant? 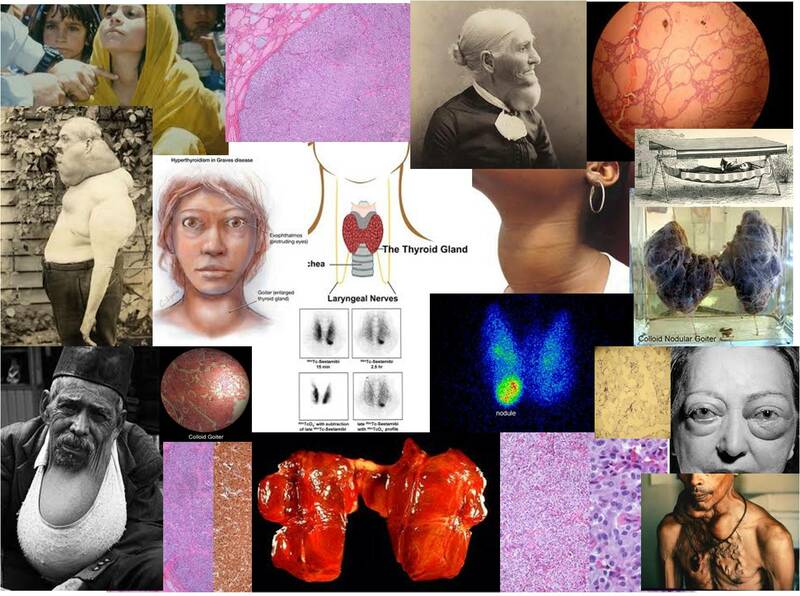 Does personal heredity play a role in the development of goiter? Is it a consequence of unhealthy living practices related to drinking, food consumption, the ways we produce our wells and make use of the local water? Do the local animals and farm animals surviving in the local vicinity play a role in the development of this disease, due to their own similar maladies? 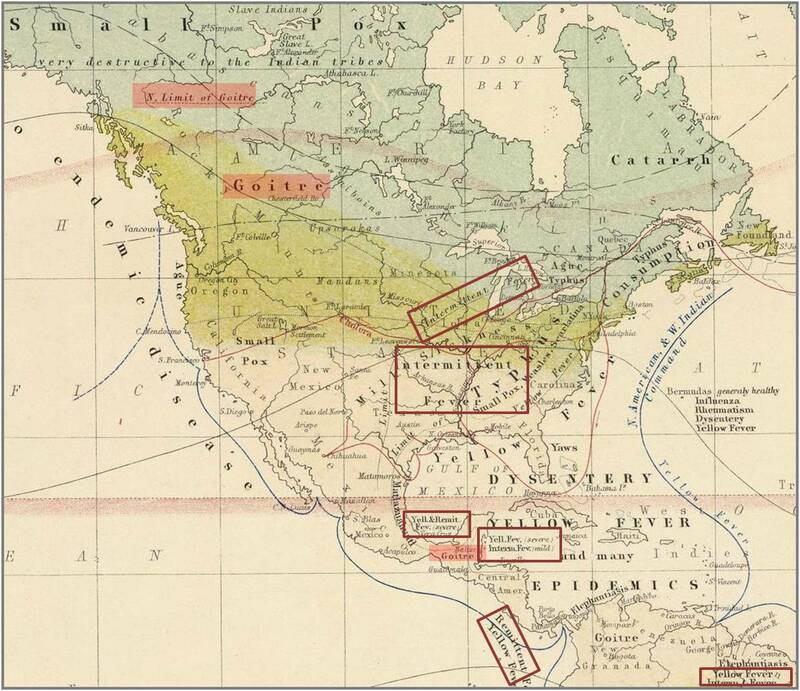 The miasm theory for disease was easy to argue along shore lines with large water supplies, swamps, deeply wooded forests, but in the prairie dominant western parts of New York on out to the midwestern Ohio territories how could it be explained? The Finger Lakes and Great Lakes helped out with this reasoning a bit in certain parts of the newly settled territories, but in dry, pristine field settings suffering from a state of drought lasting well into the winter months, this didn’t serve as an explanation once the goiter began setting in by late winter just before the thaw. 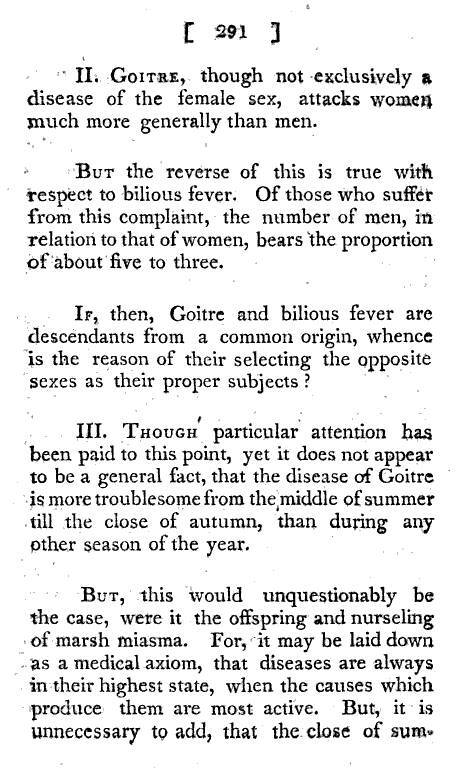 We could use one interpretation of the environment to define the season fevers, influenza and other catarrhs to strike all year, but had to have another to explain why goiter behaves so different. 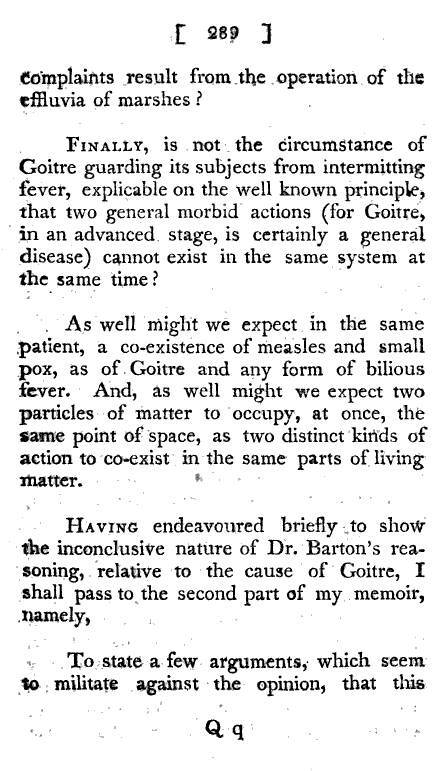 This uncertainty about the disease is why the arguments between Caldwell and Barton took place regarding Goiter. 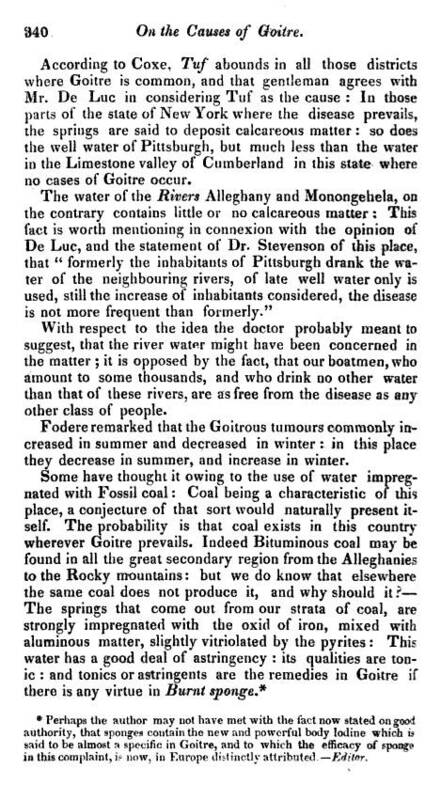 Dr. Caldwell, from the mid-Atlantic area around Tennessee and Kentucky, had his environmental experiences with miasma use to define his philosophy for disease, Dr. Barton had a distinctly different set of experiences having been raised and trained a couple of states north, in colder climate and meteorological settings in and around Pennsylvania. 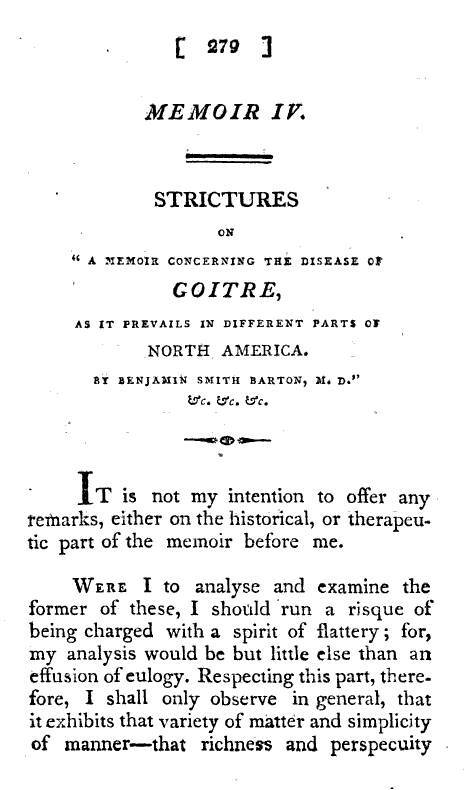 It is due to these different upbringings that a battle of opinions and philosophies began in 1804 with the publication of an essay by Benjamin Smith Barton regarding his belief regarding the causes for goiter. Caldwell disagreed with these statements. 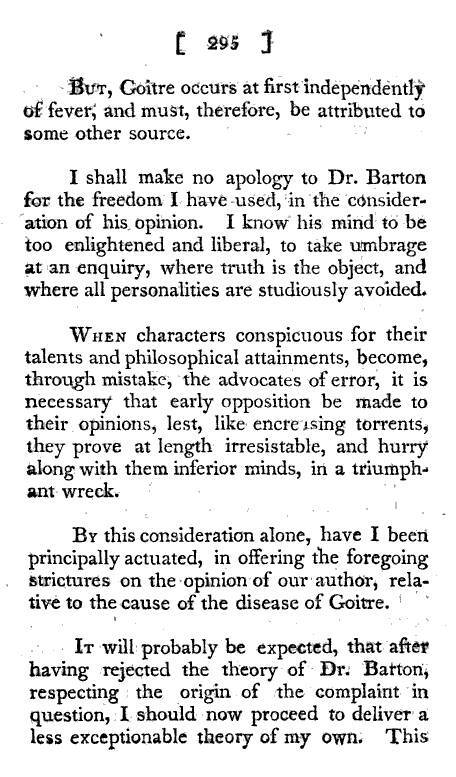 Barton’s philosophy was that goiter that was not already apparent in someone since youth was caused by the environment in which he or she resided. 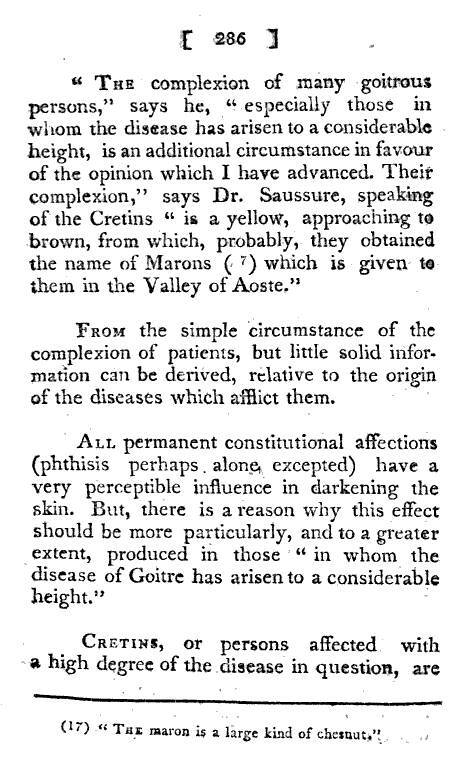 Observations made by many physicians suggested that goiter could be a consequnce of where the victims resided. Clusters of cases of goiter in certain parts of the countryside confirmed this. Miasma was the most common natural feature blamed for most diseases. It was the main cause for nearly all fevers. It was responsible for the eruption of numerous cases of diarrhea and dysentery often seen during the warmest, most humid weeks of the year when swamps began to emit their putresence and the smell of garbage and other forms of waste filled the air. Anybody living in the vicinity of putridity and noxious gases were naturally victims of recurring nausea due to this recurring experience. 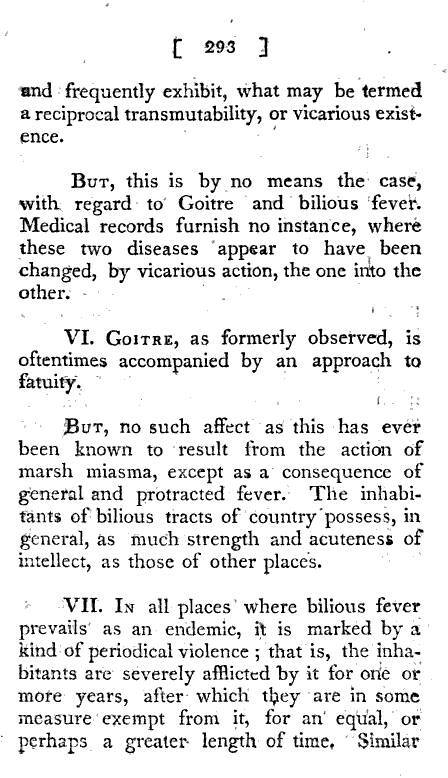 But to then experience other diseases as a consequence of this naturally led both patients and physicians to assign the cause of their nausea and discomforts to other diseases born by similar topographic and meteorologic features. 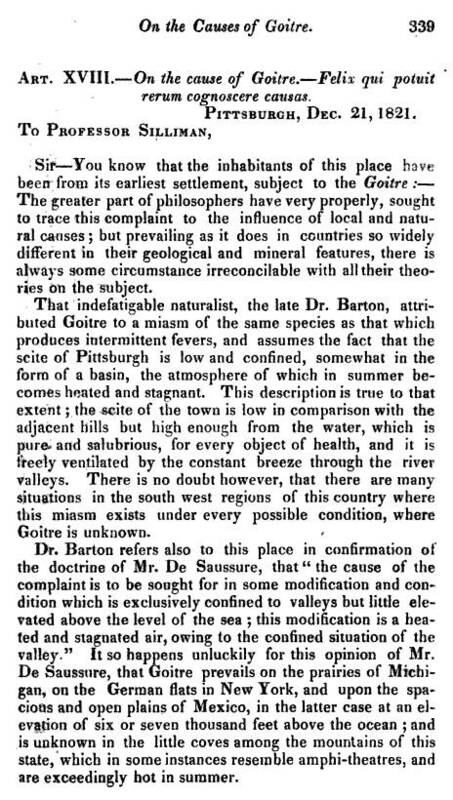 People next to the source for these diseases associated them with putridity, those situated further away such as on farms and in homesteads back in the woods blamed the problems on the local winds and temperatures that carried this putrescence elsewhere. Topography defined the routes they were to take as part of this diffusion process. 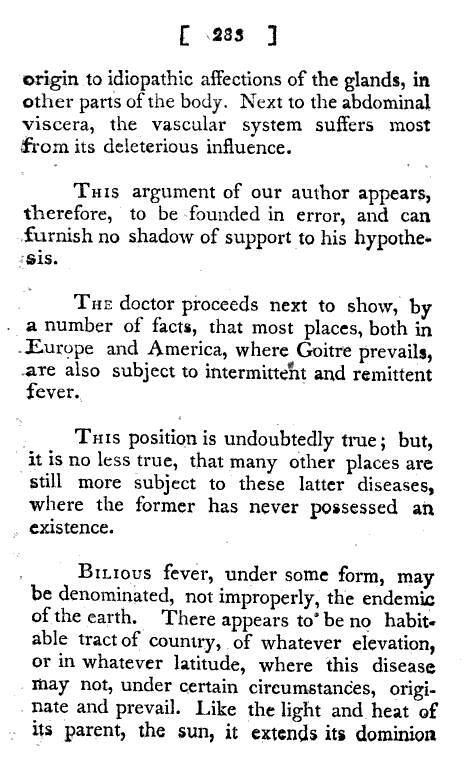 This initial argument seems credible to any physician for the time. But Caldwell noted there were distinct differences between the fevers in general and the goiter that struck people in their backwoods communities. There is an interesting relationship between Caldwell’s and Barton’s individual areas of speciality. Caldwell was a very devoted medical topographer, who at times even placed more emphasis on the relationship of topography to disease at the expense of paying little attention to the relationships between weather and climate and disease. Barton’s expertise was as a scientist devoted to natural history, zoology and botanical medicine. Of these two physicians, we’d expect Barton to uncover the relationship that exists between goiter, foodways and nutrition. 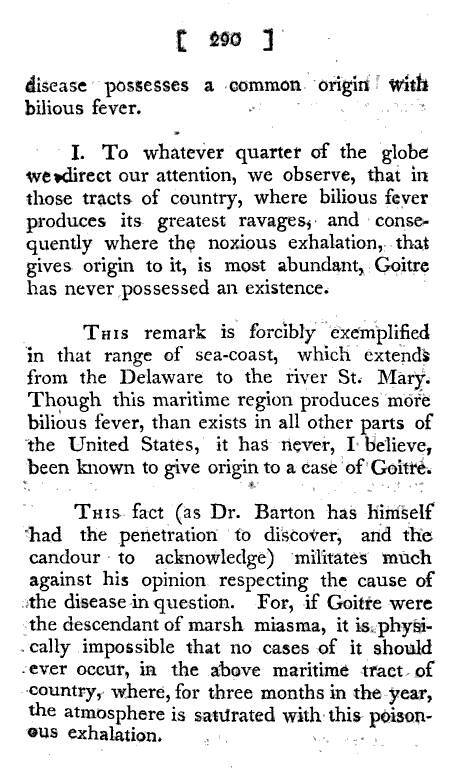 However, Barton’s explanation and theory for goiter lacks the attention to details and regional differences Caldwell’s work tended to focus upon. 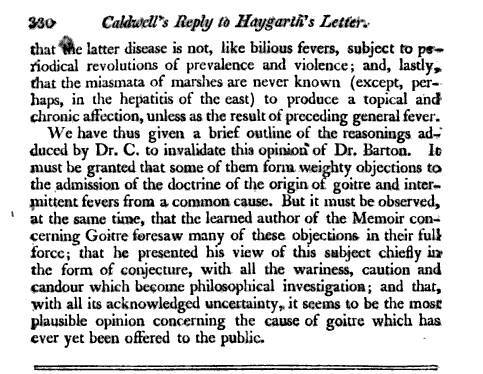 Caldwell also liked to claim that he had a better understanding of the causes for this disease in relation to living poor in the backwoods rural settings. From some of the descriptions of Caldwell’s childhood rearing, we imagine him to be another Davy Crocket of sorts, in how he managed to grow up in a small log cabin getting his education from a schools or equal stature and architecture. In such a setting, Caldwell could very well have witnessed many more people with goiter throughout his childhood and early adult years, experiences that Barton may have experienced only partially throughout his life. It is always easy in the field of medical topography or climatology to come up with speculative theories about disease, and the more detached a doctor and/or writer is trying to explain these diseases, the imaginative he or she can become. Such is the case again regarding Barton versus Caldwell’s experiences. Caldwell probably saw the cases first hand as they first became visible and evolved into their most unhealthy physically deformed states. 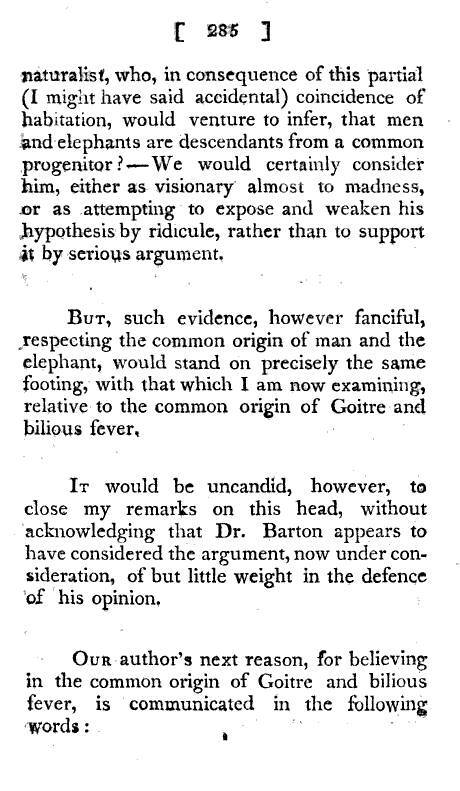 Barton, seeing these people less often, may well have seen early and late examples, had less a sense of chronology about the rate of development of this disease, and so provides explanations that seem more aggressive, more capable of demonstrating the impacts of a hostile environment, than those of Caldwell. But Caldwell based his theory on the environment more than on the individual with his/her behaviors and physique, whereas Barton based his theory on the individual. 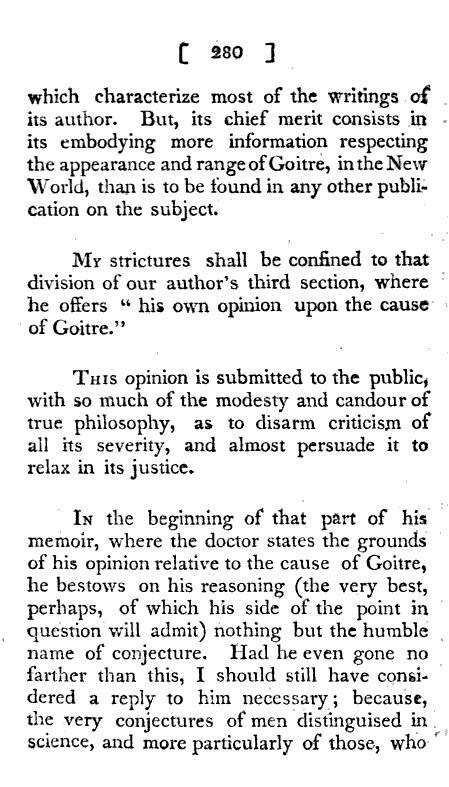 The Microcosm vs. Macrocosm issue was often a philosophical query one had as a doctor. 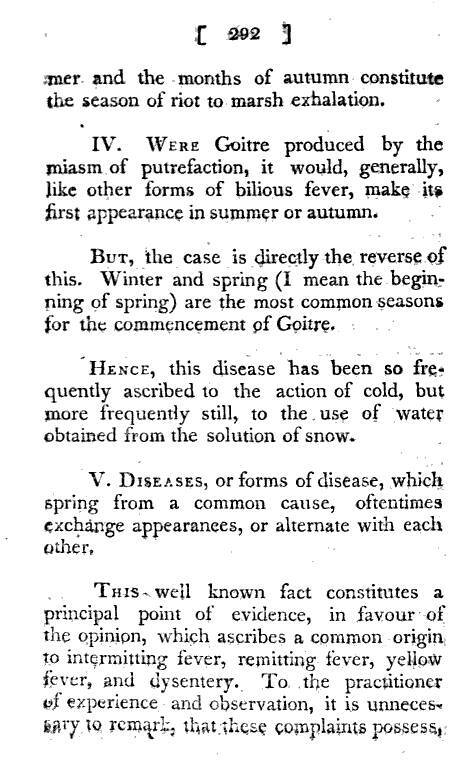 In the mid 1700s, there was this philosophy that was popular which stated that a disease was due to some alkaline substance, a humours like ingredient of the body, that could migrate about and cause disease in various forms, one after another. This pathogen could strike the liver and cause Jaundice, then move to the spleen and cause a state of melancholy, fatigue and inability to go on with life, and then strike your hands and knees and result in rheumatism, and then go to your lungs to cause pleurisy, and finally the heart causing you to become deceased. This is not really a new philosophy, and has parallels in Oriental Medicine in terms of the five element theory and the flow of chi from one organ to the next, as it changes form each time it strikes a certain center where changes naturally occur in the body’s energy, like lungs, stomach, kidneys and heart. 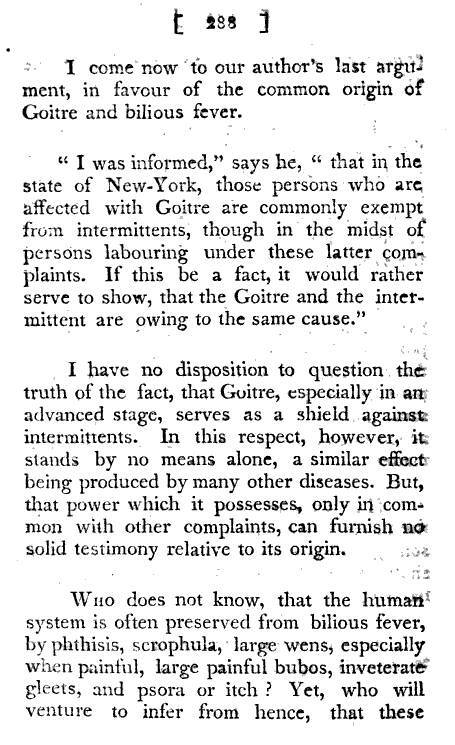 This same philosophy underlies the early 19th century theory of goiter being proposed in Caldwell’s writings. Goiter is a predecessor to other more serious diseases inherent to the region such as Pleurisy. 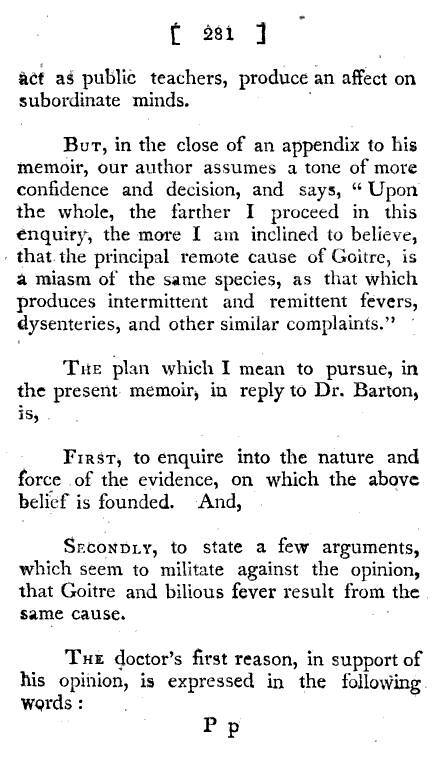 The idea that a disease moves from one organ to the next is also part of the philosophy popular just before the revolution, which maintained a following following the war up until about 1795. 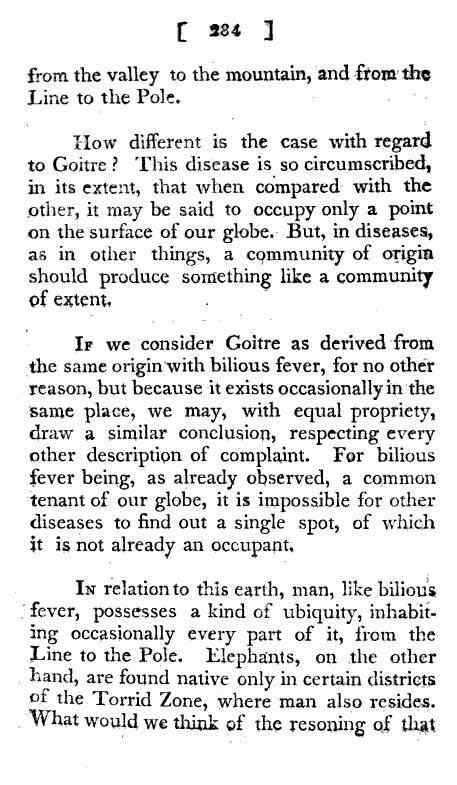 William Cullen promoted it during its final decade or two, and has very identifiable followers–any doctor who likes to talk about the soilds of disease is a solidist, and probably not a vital energy believer. Caldwell had a little of each of these beliefs embedded in his personal philosophy.